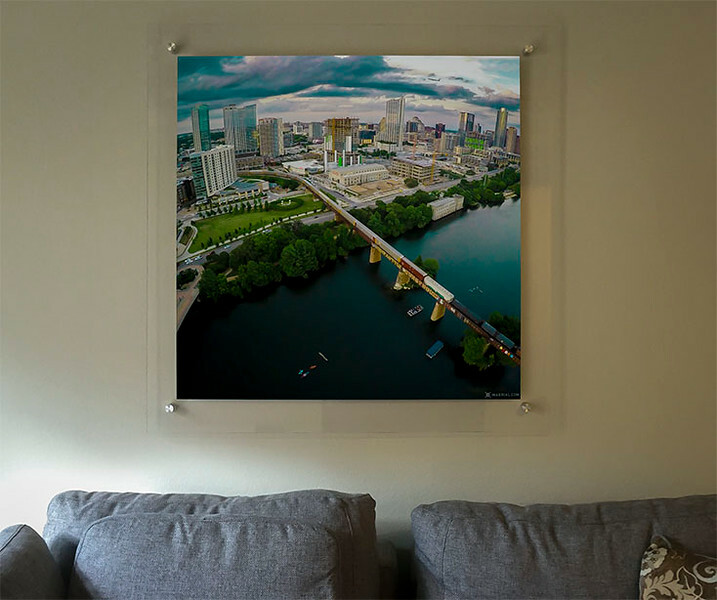 iMaerial specializes in creating affordable gallery quality pieces for offices, restaurants, hotels and practically any setting. These elegant pieces undoubtedly grab the viewers attention and are a constant reminder of how beautiful Austin really is! The pieces are back-mounted on thick acrylic with a layer of vinyl for extra protection. They're minimalist by design allowing the photography to really shine and are easily mounted to the wall using tamper-proof aluminum standoffs. The pieces are custom made to order and range from 2' x 2' up to 5' wide depending on the image and cropping. Any 'stock' image from Gerard's gallery can be mounted and produced in roughly 10-14 days. Alternatively, he can be commissioned based on the clients needs and is always open to creative discussion and collaboration.